Have not posted a project since spring, but have been trying to keep up with all the postings, quick glance anyway as I have been very busy. Repair, restoration work, house modifications etc. Anyway I got tired of all these jobs to be ready for winter, and thought its not fair, all you great craftsman making chips, I had to indulge. A logger friend had brought me a couple of large blocks of yellow cedar (pure gold) from the coast. 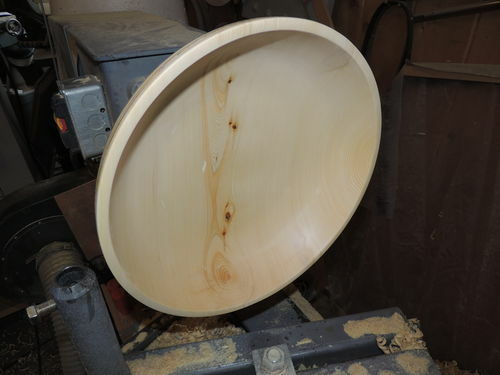 I had planned to make him a bowl in appreciation and I was anxious to try turning it. Mounted a nice large piece on the lathe and went to work. 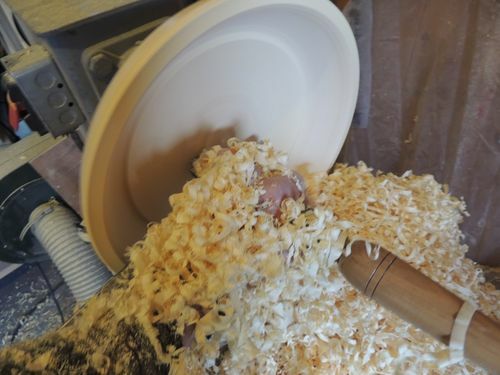 Unfortunately the fun came to an end and I had a reasonably shaped bowl, being a larger size and a soft woo I left the wall thickness thicker for durability. Time for a finish. 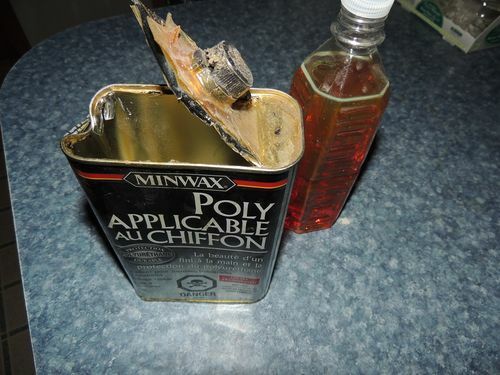 this is where the story gets crazy, I usually use Wipe of Poly, but as I have not used it in some tome I found it would no longer pour out of the container, Well maybe try another type of oil, can not think of the name, not Teak oil, It had set up too. I found an all most empty spray can of lacquer that I have used for models. 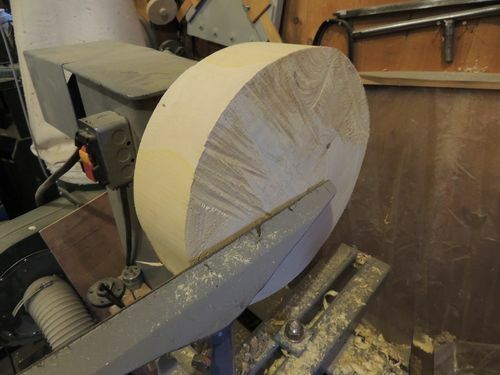 I then turned the lathe on slow speed with the thought it would go on even, not a GOOD IDEA, do not try that, wet sanded the runs out and sprayed it again, the oils in the wood would leave bare spots, I think I sanded it again and tried it twice to no success till the can was empty. What else can I use, found another near empty of Varathane water borne finish, Several attempts at that and still no success. Getting good at we sanding. Now what do I have, Well I have a half full can of semi gloss Wipe on Poly that is still liquid., I had wanted a Gloss finish. Tried that and it had lost its drying ability. I am getting desperate now. Back to the gloss wipe on poly, it maybe just had a thin skim on the surface and would be liquid underneath, chiseled the top off and salvaged what would still pour, Another bad idea, It had lost all it qualities, think by then I was smart enough to try it on another piece of wood. You say, run over to Home Depo and get a new can, Well I do not have that much time as the nearest one is 300 miles away. I had texted a friend that I knew that was in a closer town for the day, just 80 miles away, they missed the text. I thought soon as I get this heating system done and inspect I will go myself with the paper for the insurance company. Well a week or so later they where there again, and this time they showed up with the finish. They thought I had just texted them for it, as I had texted them another message that day. Wow did that finish ever work great. SUCCESS AT LAST. I do hope my friend will like the bowl, it was a real trial. I still do not have heat in my shop, though every thing was taken care of last week when I took the papers in but they called the next day and have another requirement. The stove in the house is OK to use but the major Heat source is not, we have been using electric heat up to now but want to switch over to hot water wood . Has just turned to below freezing hear but no snow yet. Unusual but not complaining. Will be working on a snot blade for may atv today and hopefully find another insurance company. Thanks for looking and listening to my story. Comments appreciated, tell me if you think I am crazy with the finishing process. I will do it right next time. Watch for my next posting, It will give you a real lift, it did my wife. It a great looking bowl but I’m thinking it should be called The Frustration Bowl. Nice looking Bowl in the End! LOL, Maybe Check with John from Gibsons the go to Finishing Expert in all things Bowls! Beautiful bowl Brian! I too love the smell of Yellow Cedar, the burls are even more aromatic. 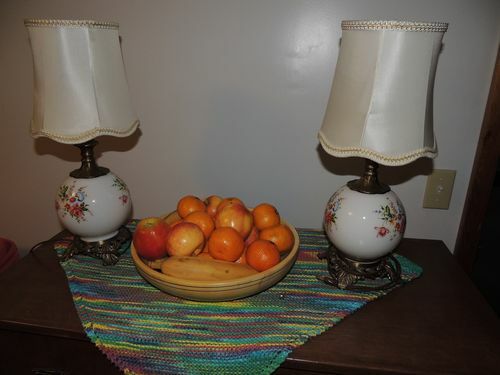 I like Salad Bowl Finish for fruit bowls, Wipe on Poly for display type bowls, but I ask the person I’m giving it to what they want. I’m thinking of trying to mix up some Bee’s Wax and Mineral Oil, might be something useful for you so far from shopping. Beautiful bowl, Brian. You have to get on the lathe from time to time so you or it don’t get rusty! A lovely bowl, Brian. Have you thought to try using resin on your bowls? There’s a guy I found recently who uses it making sinks. Fast-forward to about 10:00. See how easy he makes it look. I’m inspired to try it, though I haven’t yet (stuff’s expensive). Great story, nice work, keep busy, that is the secret for longevity or wisdom , you choose. Glad to see you ‘re having a good time. Thanks for all the nice comments and suggestions, , may be I am OK and not crazy. It happens in old age. 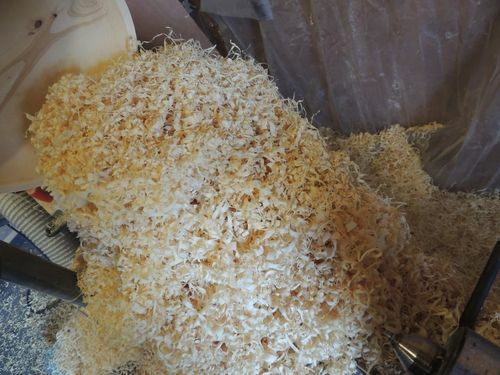 I read a fairly comprehensive article in Fine Woodworking a few years back, well many, times goes too quickly, and they explained the chemical transformation that takes place when a finish dries which makes I will say pretty much all finishes food safe. can’t remember if any wasn’t. Any way one can’t believe everything one reads and it is better to be safe than sorry. Back out in the cold to do metal fabrication and welding. Nice bowl bushie... and I can relate to the comedy of errors regarding shelved cans/bottles/tins/plastic…. Like the way you opened the top… I usually stomp on the can out of frustration… only to mop up the splatter. Have you considered shellac? If you buy in flakes and convince yourself not to drink the metho (I think you guys call it denatured alcohol) then you can just mix as required and will last a long time… by that I mean the flakes (preferably in a fridge) and any mixed shellac that has reached it’s expired date (mixed shellc is not too generous with shelf life) you can dilute it 10:1 with metho (depending on your initial ”pound cut”) and it makes a brilant sanding sealer…. Here is a link to the pound cut reference I plagiarised (from somewhere on the net), metricized it and use. PS. I use drinking metho... I call it drinking as it is 100% pure… not a 95% ethanol blend… hard to get but worth the effort. Just what we all expect form you as a final result now! Years ago, I had a woodburner in my “shop” as much for mistakes as for heat!